Sadia premiered the first full installation of her multi-channel installation ‘Ghosts of Noise’ in ‘The Model Citizen’ exhibition, RMIT Gallery, Melbourne, February 8th - March 23rd 2019. The work responds to the aesthetics of the information-delivery complex and the 24 hour news cycle. ‘The artists involved in this exhibition share similar beliefs: that thinking through making establishes how public life is experienced and understood; that as creative and critical stakeholders, artists have a central role to play in shaping public life; and that through the very act of modelling, creative processes.” - curatorial statement, The Model Citizen. 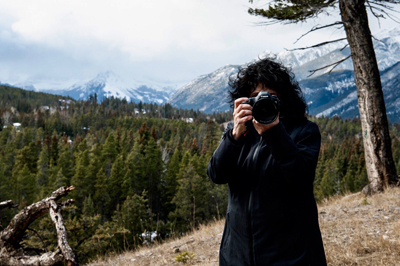 Sadia spent November 2018 on an artists’ residency at the Banff Centre for Arts in Banff, Alberta. This also marked her first return to Canada in almost thirty years. During this period she opened Thom Studio for an evening to screen works, including a preview of new work shot and filmed on location. November 2018: Lots of releases this month! Be-Bop Deluxe album ‘Sunburst Finish’ has been reissued featuring new stereo and 5.1 mixes by Stephen…. The Brand X ‘Live’ Blu-Ray has been released, footage edited and audio mixed in 5.1 by Stephen…. Howard Jones’ ‘Human’s Lib’ and ‘Dream Into Action’ box set, remastered from original tapes, along with previously unreleased material and picture discs… and Kate Bush has remastered her entire catalogue on CD and vinyl, ’Kate Bush - Remastered Part II (CD)’ includes three albums mixed by Stephen… also available on vinyl ‘Kate Bush - Remastered Set III’…. November 2018: Stephen took part in an exclusive event at Metropolis Studios, to mark the release of the box sets of Howard Jones’ ‘Human’s Lib’ and ‘Dream Into Action’ on Cherry Red. Stephen recorded and mixed the original albums. Forty guests attended this special event with Howard, the producer Rupert Hine and Stephen as they discussed the making of the albums. Melbourne, September 2018: Sadia and Stephen on a flying visit to speak, watch, look, and listen. 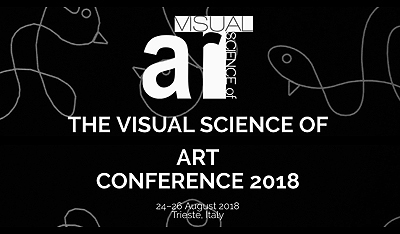 Sadia rounded out a busy summer by speaking on 'The Sacred Ground: Enhancing and Constructing the Transcendent State in the Installation Environment' at the VSAC Visual Science of Art 2018 conference in Trieste, Italy on August 25th. VSAC is organised as a satellite conference of the ECVP (European Conference on Visual Perception), the leading European conference on visual science. Sadia delivered a talk on ‘Catharsis and the Encompassing Environment in Art in the Neo-Digital Age’ at the Cognitive Futures in the Arts and Humanities Conference 2018 at the University of Kent, Canterbury in July. 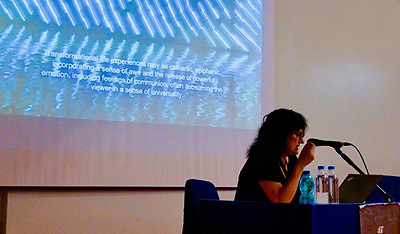 The conference drew together topics such as cognitive neuroscience and the arts, cognitive poetics, spectatorship and participation, material culture, theories of mind, empirical aesthetics and interdisciplinary methodologies. 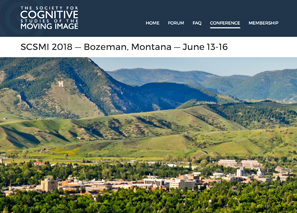 Sadia spoke about 'The 'Wow' Factor’ at the SCSMI Society for Cognitive Studies of the Moving Image 2018 Conference in Bozeman, Montana. The conference drew together an international group of philosophers, critics, scientific researchers, professional filmmakers, artists and moving image theorists for three days of presentations and discussions on topics ranging from aesthetics and philosophical inquiry to neurocinematic experiments. An eccentric and rather wonderful group of people in a spectacular location… and lots to think about. 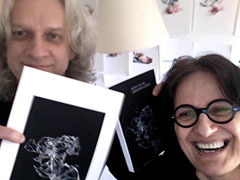 Stephen produced and mixed the new Pieter Nooten album ‘Stem’. “Nooten finds another valuable foil in British producer and mixer Stephen W Tayler… “Vari-Slowed” and “Epicural” demonstrate Nooten and Tayler’s keen understanding of the space between the notes” - Uncut, July 2018, UK. Brand X have just released their new live album ‘Locked & Loaded’, mixed by Stephen, and are preparing the release of the RoSfest 2018 concert on DVD. The video of the concert will be edited by Stephen alongside the audio mix. Stephen is also preparing some surround remixes for Cherry Red Records, watch this space for upcoming news. 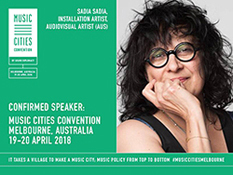 Sadia Sadia argues the case for fair wages for musicians as a speaker at the Sound Diplomacy Music Cities Convention at the Melbourne Arts Centre April 19th - 20th 2018, the first of these conferences to be held in the southern hemisphere. 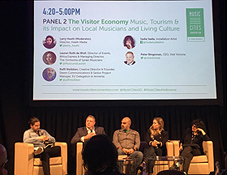 Sound Diplomacy works to create and deliver strategies that increase the value of music ecosystems worldwide. 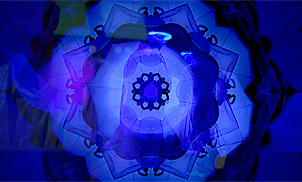 Sadia’s film/multi-channel installation ‘Metamorphoses in ‘A’ Minor’ screened at Sarah Lawrence College SLC DanceFilm in April 2018. The film features the dancer Wakako Asano, who worked closely with Graeme Murphy at the Sydney Dance Company for many years. The work is rarely seen and it was a pleasure to have it screened at SLC. Please see the ‘Films and Installations’ menu for more information about the work. December 2017: a couple of days ago a package turned up at Real World with Stephen’s gold albums for his work with Kate Bush. Delighted to see the set of three albums, a great achievement that includes the three disc version of ‘Before The Dawn’, now hanging together. An audio installation version of Sadia's 'Notes To An Unknown Lover' will be running as part of the show 'POETRY' at the George Paton Gallery, Melbourne, from October 4th - 13th 2017. 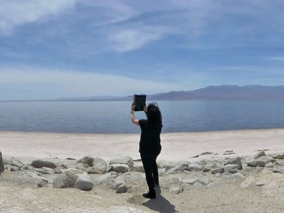 For this exhibition, the work has been processed in stereo with 3D audio software creating psychoacoustic sound localisation and distance cues. 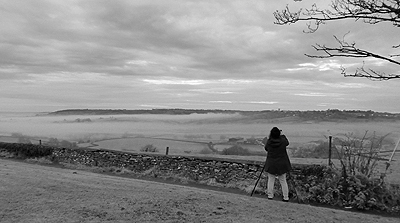 Sadia shooting footage for the triptych moving image installation ‘Every Fallen Leaf Sings on Your Shore (Box Hill at Dawn)’ in Wiltshire, November 2017. Challenging atmospheric conditions, a few false starts and early mornings. 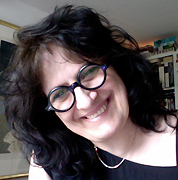 This follows on her research into the transcendent through the use of grand vista, which she is currently writing about and expects to publish some time next year. Stephen performed solo live for the first time in his life, debuting his audio-visual performance piece ‘Ostinato LIVE’ at the Pound Arts Centre, Corsham on July 22nd 2017. Not only a live solo debut for Stephen but also for the Flare Zero speaker system, with special thanks to Naomi and Davies Roberts of Flare Audio for their generosity and support. 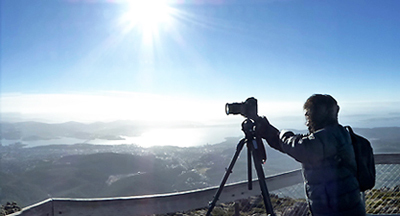 R: Standing just above the dolerite columns aka the ‘Organ Pipes’, Mt Wellington, Tasmania. We are delighted to announce that Kate Bush’s long-awaited project ‘KT Fellowship presents Before The Dawn’ was released on CD and vinyl on November 25th 2016. The album is comprised of live performances gathered from the groundbreaking, internationally-acclaimed concerts, Kate’s first in thirty-five years. Our own Stephen W Tayler mixed the album with Kate, as well as doing audio postproduction on the project. “Nothing on the record was re-recorded or overdubbed” says Stephen “It was a monumental undertaking that consumed me almost completely for the better part of the past year. 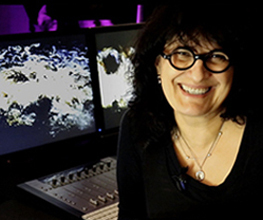 It took everything that I had to give from my many decades’ experience as an engineer and mixer, and I could not be more proud of the result”. 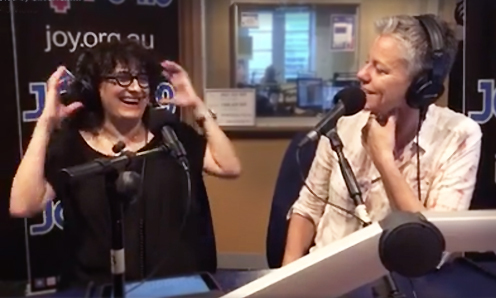 On September 24th 2016 Sadia Sadia co-hosted and was interviewed on Gillian Bartlett’s show The Silverfox on Joy 94.9FM, Australia’s only gay and lesbian radio station. Across a wide-ranging and entertaining conversation, Sadia and Gillian set about solving the world’s problems and setting things to rights. 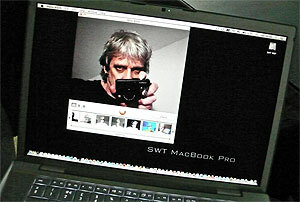 Stephen has been in Amsterdam in November 2016, performing live for the first time in decades as part of the experimental minimalist trio Nooten/Barten/Tayler. Sadia Sadia is commuting between Melbourne and the UK, pursuing her research into transcendent states and aesthetics. Stephen is just now finishing up his long off-site project, expect an announcement here shortly! 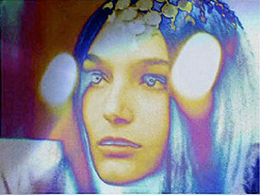 ‘San Francisco Redux No.1’ is a dramatic reworking by Sadia Sadia, Stephen W Tayler and Anthony Stern of a ‘psychedelically enhanced’ excerpt from the award-winning film ‘San Francisco’ (1968). The work is currently running as an installation at Australia’s largest regional museum, QVMAG (the Queen Victoria Museum and Art Gallery) in Launceston, Tasmania, through the end of November 2015. 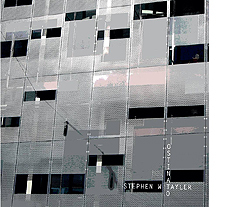 Esoteric Antenna are pleased to announce the release of a stunning new album by the award winning producer, sound designer, engineer and mixer Stephen W Tayler. 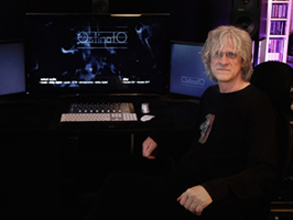 ‘Ostinato’ is a labour of love, built on a forty years’ vision by Stephen. This title was released 25th September 2015 and is available to order here. Sadia’s four-channel installation ‘Ghosts of Noise’ has been screened and discussed as part of the international colloquium ‘Les Devenirs Artistiques de L’Information’ at Sorbonne Paris on June 10th & 11th 2015, co-sponsored by Le Bauhaus-Universität Weimar & Internationales Kolleg für Kulturtechnikforschung und Medienphilosophie (IKKM), the Birmingham Center for Media and Cultural Research, and ELICO Equipe de recherche de Lyon. Stephen has compiled and pre-mastered the recently released album ‘The Art of Peace: Songs for Tibet II’, as well as mixing a handful of the tracks. 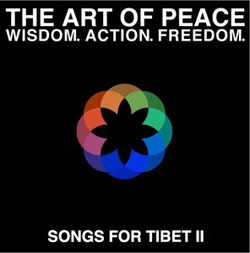 The album is in celebration of the Dalai Lama’s 80th birthday and his philosophy of peace, non-violence and compassion. Stephen mixed ‘The Book of My Life (Ostinato Mix)’ by Sting, ‘Mother Within (Ostinato Mix)’ by Beyond (feat. Tina Turner, Regula Curti, Dechen Shak-Dagsay & Sawani Shende-Sathaye) and ‘You Can’t Be Chased (Ostinato Mix)’ by Rupert Hine. He also created the ‘Remastered Shimmer’ treatment for ‘Wild Man’ by Kate Bush. The album also features contributions by Lorde, Of Monsters and Men, The Crystal Method (feat. Meiko), Howard Jones, Bob Geldof, Elbow, The Family Crest, Duncan Sheik, Eleanor McEvoy, Ed Prosek, Rival Sons and Peter Gabriel. 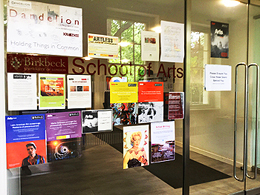 Sadia Sadia spoke about collaboration, transferability, and working in the arts, as a guest speaker at the University of London Birkbeck College Arts Symposium 2015 on May 22nd 2015. Rupert Hine and Stephen W Tayler hosted the 25th Anniversary celebration of ‘One World One Voice’ in the Big Room at Real World Studios on May 22nd 2015. Among the highlights of the evening were the screenings of the two films, originally simulcast to half a billion people in 1990 and now freshly restored by Stephen. The event was sponsored by Real World Studios, Focusrite and Chimera Arts. Stephen has been working as a director and creator of concert visuals, with the launch and international tour of the ‘Engage’ project. The project debuted on February 20th 2015 at Indigo at the O2 and the Saban Theatre in Beverly Hills and wrapped at the Gramercy Theatre in New York. "To me, sonics and visuals go hand in hand, and I have always 'seen' music and audio" says Stephen "I develop my visual work as an interpretation of phrasing, rhythm, and my reaction to the dynamics of what I hear." In October 2014, Sadia premiered ‘Fugue (Die Wende)’, a filmed installation about the removal of light. The work formed part of the City of Leipzig’s ‘Lichtfest 2014 Kulturparcours’, a city-wide event celebrating the ‘Peaceful Revolution’ demonstrations of October 9th 1989 that are credited with bringing about the collapse of the fascist DDR government, and the fall of the Berlin Wall exactly one month later. The work ran across two locations: as part of Sadia’s solo show ‘Echoes and Ashes’ at Spinnerei’s LIA, as well as at Halle 14 Zentrum für zeitgenössische Kunst (Centre for Contemporary Art). Stephen has recently concluded working on the Kate Bush show ‘Before the Dawn - KT Fellowship’ at the Hammersmith Eventim Apollo. He had been rehearsing with the project since June, and the shows opened on Tuesday August 26th to international acclaim and universally wonderful reviews. "I am so proud to be associated with this project, and very touched that Kate has trusted me to manage and mix her voice. It is an honour and a privilege to be a part of the wonderful sound team, an experience that will remain with me for the rest of my life." ‘Before the Dawn’ ran until October 1st 2014. From August to October 2014 Sadia lived and worked in Leipzig. 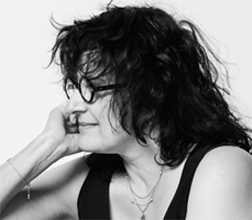 In September 2014, she premiered her thirty-channel audio installation ’Notes To An Unknown Lover‘ (‘Hinweise zu einem unbekannten Liebenden’) at the Leipzig Spinnerei ‘Rundgang’. The work is based on her artists’ monograph of the same name and each channel features one poem, recorded by the artist. The varying lengths of the lines of text, broken by set intervals, combine to form a cascade of sound. This produces a random reading of the text from which limitless discrete combinations arise, creating a infinite number of ‘fresh’ readings of the work. 'All Time and Space Fold Into the Infinite Present (Cataract Gorge') premiered at the QVMAG Inveresk (Queen Victoria Museum & Art Gallery), Launceston, Tasmania, on January 10th 2014. It is a monumental installation, comprising three channels set across a nine foot by forty-eight foot screen, inspired by an interpretation of Cataract Gorge, Launceston and features footage of the rapids captured by the artist in the Gorge. 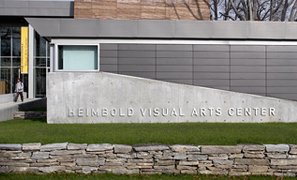 The work ran through to March 2nd 2014, and now forms part of the Museum's permanent collection. 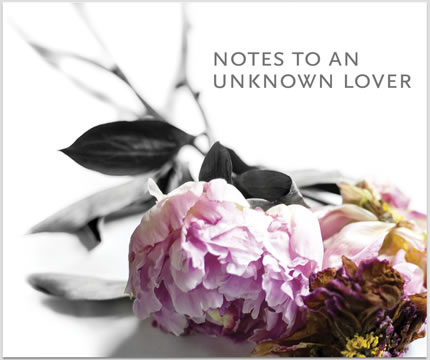 ‘Notes To An Unknown Lover’ a deeply intimate and personal artist's vision by Sadia Sadia. 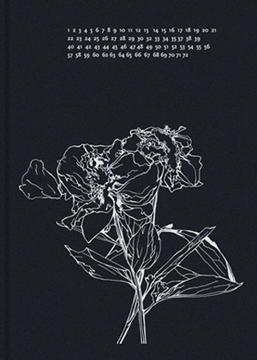 First printing, limited edition of 950 copies. May 20th 2013: Sadia’s book goes to press at Butler, Tanner & Dennis in Frome, Somerset. BT&D have been printing in the UK for over 160 years and specialise in the production of colour and fine art books (see photograph of the Heidelberg press, above, with the empty wooden paper pallets in the foreground). The A5 book is printed on 150gm coated Condat Matt paper in four colour process throughout. Wibalin endpapers, case bound, thread sewn, unprinted case on Brillianta material mounted over 2750 micron board, foil blocked spine and front in Kurz Colorit 932. Update July 2014: It is with great sadness that we report that Butler, Tanner & Dennis, of Frome, Somerset, winners of ‘Best British Book’ at the British Book Design and Production Awards (BPIF) 2013 held on 4 November, and Book Printer of the Year in eight of the last ten years, went into liquidation on May 23rd 2014. They were the UK’s leading book and publications printer for 166 years. It was a privilege to work with their exceptional fine art team on ‘Notes to an Unknown Lover’, and they manufactured a book which is a beautiful object in its own right. It is difficult to believe that the factory is being decommissioned and that we will never get the chance to return. January - October 2013: In January of this year, Sadia and Stephen started sharing a project space at Real World Studios. “It was a big move, and a complete change to our old patterns of working” says Sadia. 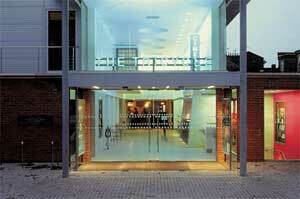 In October, they inherited the lease of the Millside studio, and Real World became ‘home’. The studio is currently set up for sound, still and moving image work, but the space can be adapted and optimised depending on the project at hand. The studio has most recently been used for the post-production and modelling of the acoustics of an exhibition space, in order to test the audio prior to an installation. We are delighted to report that Stephen's brilliant remix of Running Up That Hill (A Deal With God) 2012 by Kate Bush was played in its entirety at the London Olympics Closing Ceremony to, well, rather a lot of people. 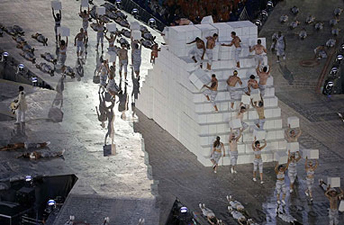 Officials put viewing figures around the 750 million mark. We are all incredibly proud of Stephen. R.U.T.H reached No. 6 in the BBC official Top Forty singles chart. April 2013: A big job, but layouts and typography completed at last. Signed off, ready for pre-press. '50 Words For Snow', the latest album of original material by Kate Bush, won the South Bank Sky Arts Award 2012 for Best Pop Album, beating strong competition from Adele and P J Harvey, on May 1st 2012. Comprising seven new tracks with a running time of over an hour, the album includes contributions from Elton John, Andy Fairweather Low, Stephen Fry and Steve Gadd, among many. "‘Fifty Words for Snow’ is a brilliant, magical album. With these beautiful songs we wanted to convey the feeling of snow and winter in the sound. 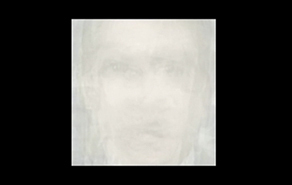 The first song, ‘Snowflake’, which features voices and piano, introduces atmospheric elements of guitar, drums and orchestra along with occasional frozen moments of audio. This sets a shimmering soundscape that carries on into the album creating a unique and immersive listening experience. I’ve heard these songs hundreds of times, and they still move me deeply every time I hear them" says Stephen. "Of the two hundred and fifty plus albums I've worked on, this was a completely unique and remarkable experience." We are delighted to say that the album has had an almost overwhelmingly positive reception both at home and internationally (The Guardian, The Times, The Independent, The Sunday Times, Mojo, The Wall Street Journal, The Los Angeles Times, NME, The New York Times, The Washington Post, and Time Magazine, among many). 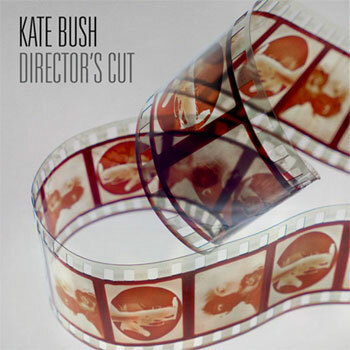 Kate Bush released the new album “Director’s Cut” on her own label Fish People, in conjunction with EMI. It entered at Number 2 in the UK Album chart. Stephen mixed eight of the tracks on this album, as well as recording some of the guests. Sadia and Stephen are contributing photographers to the latest edition of the photography publication DayFour ‘Ulysses 2’. 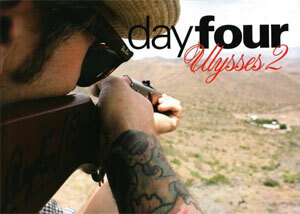 They both participated in the original DayFour ‘Ulysses’ day in 2005, and were delighted to revisit the project in 2010. 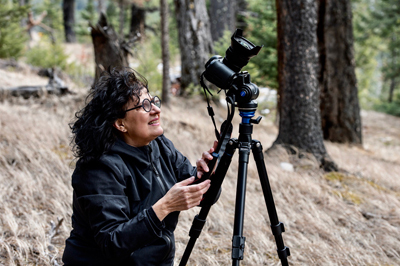 They are the only two contributors who interacted (photographically) with each other over the course of the day(s), which makes them unique among the photographers contributing to the project. The exhibition DayFour 'Ulysses 2' ran at theprintspace, London from December 3rd 2010 to January 2011. Stephen has created audio-interactive visual pieces to accompany 25 songs for a live concert, (now released on DVD), a project that furthers his involvement with the moving image. Stephen is mixing and editing many projects in his project studio. “These days the artist can upload multitrack audio files, and I download them and work ‘remotely’ from my studio. I can then in turn upload my mixes in AAC format and email a link to the musicians and labels for approval. E-mixing is proving very popular and is extremely cost-effective” says Stephen. 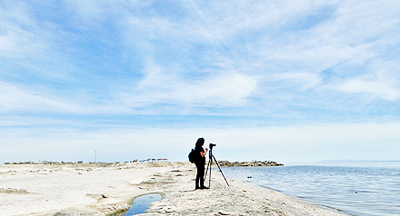 Sadia has travelled to Liverpool, New York and Argentina, and is currently working on two new installation projects, as well as developing a new website. Stephen recorded and mixed the debut album 'Dreamers' by Mattia De Luca with producer and guitarist Phil Palmer, as well as musicians Pino Palladino, Ian Thomas and Dave Hartley. The album was completed at Forward Studios in Grottaferrata, near Rome, Italy, in December 2009. More information as well as excerpts from the installation can now be found at the FILM MENU page. right: Wakako Asano, Tom Gleeson (director of photography) and Sadia Sadia on the set, Sydney, Australia, September 2009. 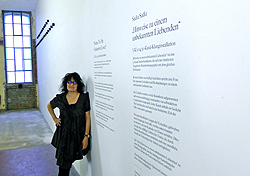 Sadia was awarded a Studio 18 artists' residency, for international "contemporary visual artists pursuing an innovative practice in a professional capacity", at Gertrude Contemporary in Melbourne, Australia, during August and September 2009. On September 4th she opened her studio to the public, to exhibit the first of the ‘ghosts’ from her 2009 work-in-progress ‘Noise’. "I have been building the 'ghosts' of information delivery, the 'entities' of the digital age" says Sadia. 'Noise', to date, comprises four single-channel installation works with soundfields, which can be shown either individually or collectively. Sadia was also the recipient of a Project Grant from the British Council (Aus) to support her filmed multi-channel installation work ‘Metamorphoses in A Minor’, which was the subject of her Artists Talk (Sadia in conversation with Amita Kirpalani) at Gertrude on Tuesday September 22nd 2009. The Tricycle Theatre ("Britain's leading political theatre" The Guardian) has screened 'The Noon Gun' as part of their season 'The Great Game: Aspects of Afghanistan' May 1st-10th 2009. San Francisco Redux No. 1’ has been screened as part of the Belfort Film Festival, France, November 23rd - 30th 2008, as well as Film Mutations, Zagreb, Croatia, November 30th - Dec. 5th 2008. 'San Francisco' and 'San Francisco:Redux No.1' have been screened at the Lussas Doc Film Festival 'Etats Generaux du Film Documentaire' in France on Wednesday 20th and Thursday 21st August 2008 as part of the programme 'On the Subject of Regrettable Searching - Body to Body, the Filmed Body' . With the support of the British Council, ‘The Noon Gun’ has had its Pakistani premiere as part of the World Performing Arts Festival, November 13th - 23rd 2008, in Lahore, Pakistan. 'The Noon Gun' was screened by the Cleveland Museum of Art on the 14th and 16th of May 2008 as part of a program of curated film screenings. 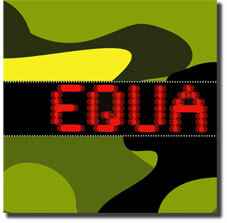 The original, eponymously titled 'EQUA' album, originally released in 1996, is at last available through iTunes. For those of you who are new to this work, please find more information here. Sadia and Stephen are delighted to announce the world premiere of four new short films on Friday June 27th 2008 at La Cinémathèque Française. 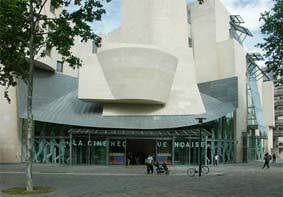 La Cinémathèque is situated in Paris, and is housed in a building designed by Frank Gehry. It is home to the largest film archive in the world and has been described by Martin Scorcese as the "spiritual home of filmmakers worldwide". Stephen spent 2007 recording and mixing in Italy, India and the US. In India he had the pleasure of recording some of India's top musicians at Yash Raj Film Studios in Mumbai, including Louiz Banks, Sheldon Shaun D'Silva, Niladri Kumar, and percussion maestro Sivamani, for an album by Mongolian singer-songwriter Nominjin. 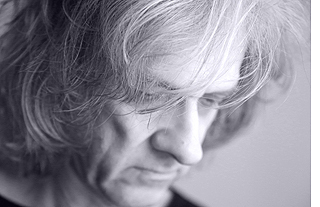 Stephen began 2008 by mixing an album at his studio in Wiltshire for singer-songwriter Clark Datchler, and remastering the titles for the Chimera Archives digital releases as well. In September 2008 he mixed the 3 CD set of Howard Jones' 25th Anniversary concert, recorded at the indigO2 in London. Stephen also authored the DVD for this concert. In December 2008 he has been working with Rupert Hine on the new Nolwenn Leroy album. 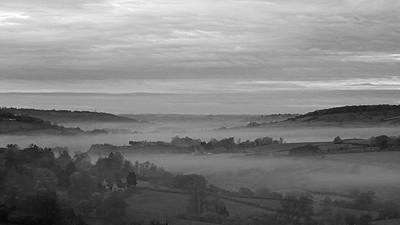 2009 has seen Stephen preparing compositions and soundscapes for Sadia's current installations, along with mixing and designing the sound for a feature film. 'The Noon Gun' was screened by Tolo TV, the most popular liberal TV station in Kabul, Afghanistan, and was also screened by the Bhutan Broadcasting Service (the only service to broadcast inside the Bhutanese border) on July 26, 27 and 28, 2006. It was shortlisted, along with 6 other films, for The Satyajit Ray Foundation Short Film Competition in London. Extracts from the entries were screened at the Award Ceremony held in the David Lean Room of the British Academy of Film and Television Arts (BAFTA), Piccadilly, London on the afternoon of Sunday 23rd April 2006. 'The Noon Gun' had its world premiere at the 53rd Melbourne International Film Festival in 2004. It played to a packed theatre and was a resounding success. It was also shown at the 'Bite The Mango' Film Festival at the National Museum of Photography, Film and Television in Bradford, September 2004. 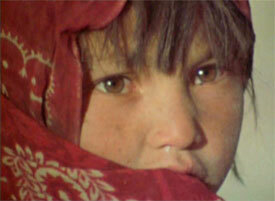 In 2005 it featured as part of 'Films From The South' Festival in Oslo, Norway.